This piece was a dream to create. 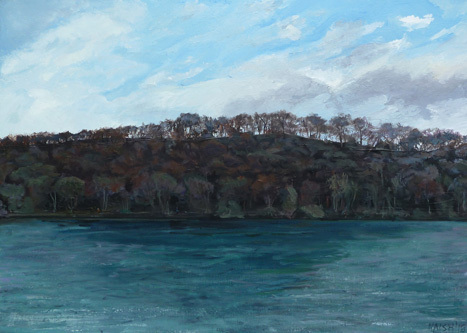 I had painted this view before from a holiday let on the opposite bank of the lake, though in a square format. This had been done from life and a copy of this image proved invaluable in deciphering all the colours in the scene. Photos of the scene were useful, but only told half the story. It’s quite a simple composition, with a flat view providing almost strata. A few people on the bank add some interest. Very pleased with the result as it gives a sense of the ominous weather. I hope that it also captures that unknown animal call that echoes through this sort of forest.